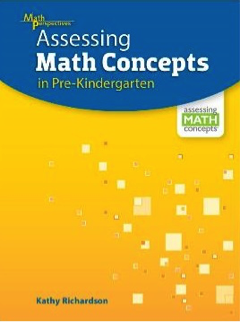 Developing Math Concepts and Assessing Math Concepts in Pre-Kindergarten are designed to help teachers enable all young children to develop a foundation for mathematical thinking and reasoning skills. Teachers gain knowledge of how mathematical ideas in a Pre-K environment are investigated through play, active participation, intentional learning tasks, and opportunities to investigate ideas. The assessments uniquely focus on how children learn number concepts. They are simple but informative and help teachers gather important data about what each student knows and what they need to learn.